My niece Penny is a stellar baby model. 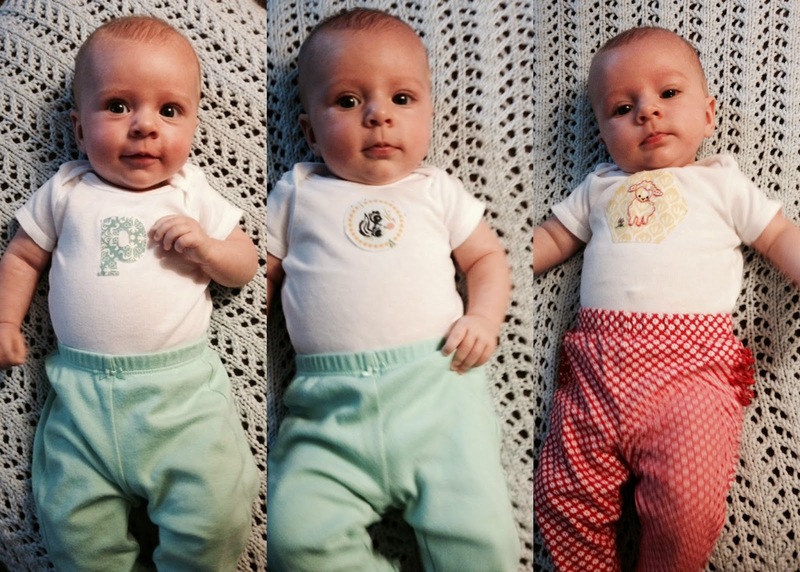 I wanted to make her some cute onesies, so I started with fabric appliques (like I've done before here and here). She got a "P is for Penny," a little fussy-cut skunk ('lil stinker), and a hexagon with a little embroidered lamb (pattern from Nana Company here). Then I decided to try something new: freezer paper stencils. I spent some time looking for designs to use on Google Images -- you need a fairly simple design that lends itself to stenciling, meaning that you have to be able to subtract the design from the outline in order to put it back in with paint. I tried my stencil technique with two designs for Penny: a feather and a ladybug. I used Martha Stewart craft paint (suitable for multiple surfaces, including fabric), applied three coats, and heat-set it with the iron. 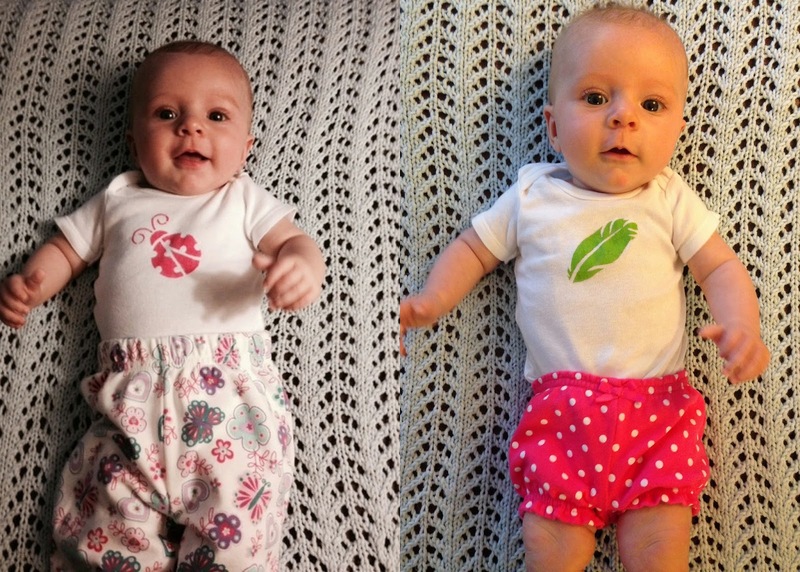 My sister reports that the painted onesies are holding up well in the wash, so the project is a success -- especially since Penny looks so darn cute in them. 1. Trace the stencil design onto the paper side of the freezer paper (not the waxy side). I like to tape them to a window -- design first, then freezer paper on top -- so that I can see the lines clearly to trace them. 2. Use the craft knife to remove the parts of the stencil that you want to appear in paint. 3. Iron the fusible paper stencil to the item you're embellishing, and get your paint ready. 4. Apply a light layer of paint to the stencil. Let it dry according to the paint directions, and then apply a second layer. After the second layer is dry, you can add a third layer if you think it's needed. I only used two layers of paint on my ladybug onesie. 5. After the paint is dry, carefully peel the stencil away. It should come off pretty easily. 6. Heat set the stencil by placing a pressing cloth or thin dish towel on top of it and applying a hot iron. And you're done!